Attempting to create birthday invitations yourself can be super easy and fun. Creating your own printable birthday invitations using photos, graphics, and clip art gives you the freedom to completely customize your invites, as well as save some money by printing them yourself from your own printer. If the idea of designing invitations from scratch seems like a nightmare to you then fret no more. I have an easy solution! And that solution is digital scrapbooking! Both of my children's birthdays are within less than a month of each other. So when I decided to throw them a tandem birthday party, I knew right away that I would have a bit of a dilemma coming up with party supplies. Both children's favorite thing is the Nick Jr. TV show "Yo Gabba Gabba". When I went to the party store to ask them if they had any Yo Gabba Gabba party stuff, the clerk looked at me like I had 3 heads. "Yo Gabba Wha?...". I wanted ot make an invitation (and party) that would stand out and incorporate both of my kids so I set out to design birthday invitations from scratch. I also needed something very simple to create and fast. So I turned to online digital scrapbooking! More precisely, I visited Scrapblog.com! I decided I wanted to incorporate photos of both of my children to create birthday invitations that they would really love. I actually cropped my photos way down to make it look like my kids were sort of hanging out with the Yo Gabba Gabba characters. And boy did they ever LOVE them. To crop the photos down I first uploaded the pictures and opened them into a porogram called Photoshop. If you do not have Photoshop, or do not want to buy it, any photo editing software should do, so long as it has a paint or erase tool. A great free program that is available on the web is Paint.net. Basically I cropped the photos close around my children. I then zoomed WAY in and erased the entire background from around them. I then uploaded the cropped pictures of my children into my Scrapblog.com account. I also went on the hunt for some Yo Gabba Gabba clip art. When I found some good images they were all on one file, so I had to use Photoshop to crop each character down individually and upload them into Scrapblog. To do this I simply cropeed the image, then chose "save as" and gave the file a new name, and then re-opened the original file and started over again. Once I had everything in uploaded to my Scrapblog page, all I had to do was start re-arranging and creating a design that suited my needs. 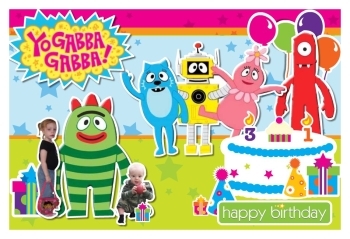 I chose a very bright birthday themed set of backgrounds, stickers, and borders, all in bold colors to suit my Yo Gabba Gabba invitations. They even have some pages pre-set for you so that all you have to do is add or subtract whatever you want to and then save it. 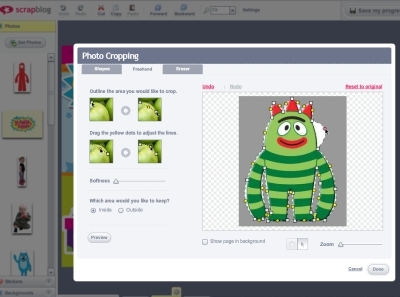 You can also crop picture, graphics, and images, within the actual scrapblog builder using a nifty crop tool. I used it on all of my Yo Gabba Gabba charachters due to the white border they all had around them. Using their cropping tool you simply move the dotted lines to the borders of where you would like them to crop and it does the work for you and even smooths everything out too. You can place a text box straight onto the page and type with it to add your invitation wording and details. I opted for printing mine on the back of the invitation. I designed a separate backing using photoshop. I found a font that reminded me of the TV show, and downloaded a font to create birthday invitations with a branded look. I even tried to match the wording to how they talk on the show. "Hey everybody! It's time for a birthday party!!" To finish up and print the invitations you must first publish the scrapblog page. Don't worry, you can set your page to private! 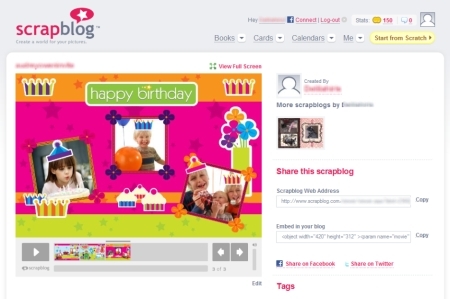 You can choose to either print it right from you Scrapblog page or save the entire design page as a Jpeg file.